I recently had to install Linux Kubuntu 13.10 Saucy Salamander (at the time of writing I’ve already upgraded it to 14.04 Trusty Tahr) on a Dell Precision M3800 (a really cool and powerful laptop, see the details here). The installation went really smooth, and I’m enjoying a very fast and stable Linux OS on this laptop. In this blog post I’ll detail only a few tips and further tweaks after the installation. As for the initial setup (Hard disk resize, Backup and UEFI Boot issues) I followed this really nice detailed guide, http://www.everydaylinuxuser.com/2013/09/install-ubuntu-linux-alongside-windows.html, and I strongly suggest to do the same, especially if you have the same laptop. Here some tweaks after the installation. 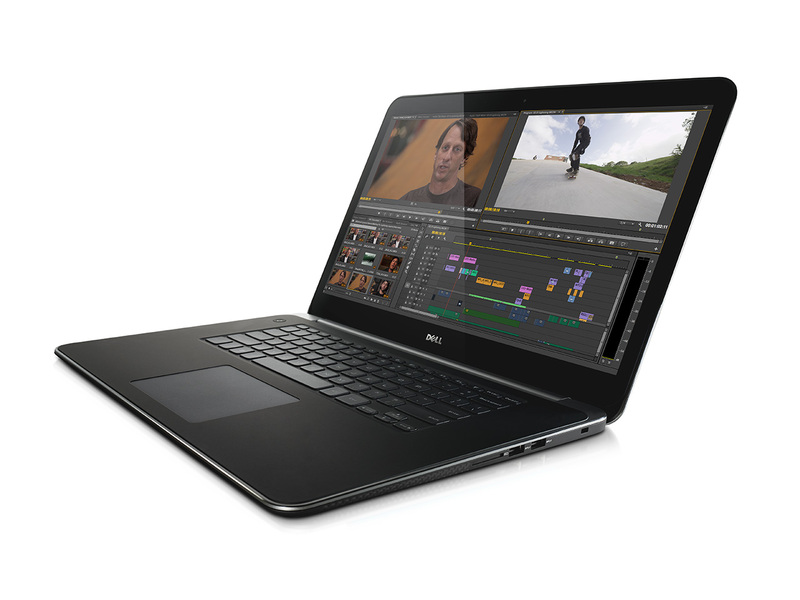 This laptop comes with the “crazy” resolution of 3200×1800! Unfortunately, this is barely usable at least in my experience: everything is so small that I can’t read almost anything… adjusting the DPI as suggested here really did not help: the fonts, window border become readable and usable, but the system looks ugly… (by the way, the same problem holds in Windows 8, at least for my everyday program, i.e., Eclipse: most fonts and icons are not readable)… until these resolution problems are fixed in Kubuntu (and in some applications as Eclipse), I reverted the resolution to something smaller (and still the resolution is high :), that is 1920×1080. First of all, make sure you enable the anotime option for your SSD partition in /etc/fstab to avoid further writings to your SSD disk. As reported here, http://askubuntu.com/questions/18903/how-to-enable-trim/, scheduled trim seems to be the preferred way to keep your SSD performant. Also run powertop when you’re on battery to check for further optimizations. Install Bumblebee, as detailed here: https://wiki.ubuntu.com/Bumblebee. At first, I thought that Function keys were not working at all… then I discovered that on new laptops like this one F-keys are default to their media mode (!). You can change the default behavior of the F keys in the BIOS, but I prefer the F-Lock icon on the Esc button: this will take them back to their standard behavior. This entry was posted in Uncategorized and tagged dell, kubuntu, laptop, linux, m3800 on May 10, 2014 by Lorenzo Bettini. First of all, thanks a lot for your tutorial. I install kubuntu 14.04 on the same laptop Dell M3800 right now. I however have a problem with wired connection. And don’t find any solutions to solve it. My Wireless connection work fine, but impossible to connect with my Wired Eth0. I always receive message “IP configuration unavailable”. Did you have same problem with your ? I’m not expert in Linux system and maybe I missed something or do something wrong ? Ludovic, I wouldn’t know… Does your router support DHCP? Is DHCP enabled for the wired connection? Jun 2 17:50:58 KED-M3800-LBO NetworkManager: Auto-activating connection ‘argos-lan’. Jun 2 17:50:58 KED-M3800-LBO NetworkManager: Activation (eth0) Stage 1 of 5 (Device Prepare) complete. Jun 2 17:50:58 KED-M3800-LBO NetworkManager: Activation (eth0) Stage 2 of 5 (Device Configure) successful. Jun 2 17:50:58 KED-M3800-LBO NetworkManager: Activation (eth0) Stage 3 of 5 (IP Configure Start) scheduled. Jun 2 17:50:58 KED-M3800-LBO NetworkManager: Activation (eth0) Stage 2 of 5 (Device Configure) complete. Jun 2 17:50:58 KED-M3800-LBO NetworkManager: Activation (eth0) Beginning IP6 addrconf. Jun 2 17:50:58 KED-M3800-LBO NetworkManager: Activation (eth0) Stage 3 of 5 (IP Configure Start) complete. Jun 2 17:51:18 KED-M3800-LBO NetworkManager: (eth0): IP6 addrconf timed out or failed. Jun 2 17:51:18 KED-M3800-LBO NetworkManager: Activation (eth0) Stage 4 of 5 (IPv6 Configure Timeout) complete. Jun 2 17:51:43 KED-M3800-LBO NetworkManager: (eth0): DHCPv4 request timed out. Jun 2 17:51:44 KED-M3800-LBO NetworkManager: Activation (eth0) Stage 4 of 5 (IPv4 Configure Timeout) complete. Jun 2 17:51:46 KED-M3800-LBO NetworkManager: Auto-activating connection ‘argos-lan’. Jun 2 17:51:46 KED-M3800-LBO NetworkManager: Activation (eth0) Stage 1 of 5 (Device Prepare) complete. Jun 2 17:51:46 KED-M3800-LBO NetworkManager: Activation (eth0) Stage 2 of 5 (Device Configure) successful. Jun 2 17:51:46 KED-M3800-LBO NetworkManager: Activation (eth0) Stage 3 of 5 (IP Configure Start) scheduled. Jun 2 17:51:46 KED-M3800-LBO NetworkManager: Activation (eth0) Stage 2 of 5 (Device Configure) complete. Jun 2 17:51:46 KED-M3800-LBO NetworkManager: Activation (eth0) Beginning IP6 addrconf. Jun 2 17:51:46 KED-M3800-LBO NetworkManager: Activation (eth0) Stage 3 of 5 (IP Configure Start) complete. Jun 2 17:52:06 KED-M3800-LBO NetworkManager: (eth0): IP6 addrconf timed out or failed. Jun 2 17:52:06 KED-M3800-LBO NetworkManager: Activation (eth0) Stage 4 of 5 (IPv6 Configure Timeout) complete. Jun 2 17:52:31 KED-M3800-LBO NetworkManager: (eth0): DHCPv4 request timed out. Jun 2 17:52:32 KED-M3800-LBO NetworkManager: Activation (eth0) Stage 4 of 5 (IPv4 Configure Timeout) complete. Ok, no problem I’ll continue looking for on forums :-). I just try to install Kubuntu 14.04 on a M4800 with QHD. For whatever reason during installation the screen stays black. Only when I press the power off button I get to see the Kubuntu Logo for a moment before it ejects the DVD. In Dell support forums I found that I maybe should disable ‘graphics switching’ in BIOS, but I don’t have this setting. Do you have any idea what the reason could be? During boot when Kubuntu is loading I hit the “del” button. That way at least the first screen appeared (don’t ask why). Then I was able to use F6 to select “enhanced options” (or whatever) and here could choose “nomodeset” which seems to do the trick (found that in some other forum). Also this could be set with grub if somehow you manage to get this to appear on the screen. Ciao Lorenzo, thanks for your post! -The minidisplay and hdmi ports work ? -Is it possible to use both at the same time (with 2 monitors) ? -Is it possible to disable the nvidia card from the Bios ? I’ve only tried once to connect the laptop to a monitor using the HDMI port and it worked perfectly. As for the other things I don’t know (I use bumblebee). As for battery life, it has improved in Linux (around 3 hours if programming), but in Windows it’s still better (over 4 hours); on the other hand, to get good powersafe in Windows, the laptop gets really slow, while in Linux you can still work perfectly (but the consumption is higher). 3 hours is not so much but with 61 or 91 Wh battery? I read somewhere that there is an unusual drop down of battery performance after 1-2 months. Is it the same to you? Have you the coil whine problem? These are the last questions, I promise! I don’t know about the battery specs, and I did not notice battery performance drop down. As for the coil while (I think you mean the noise) it happens but very rarely. Thanks a lot for all information!!! This question is obviously not about the M3800 but I am really hoping if you would happen to know whether Linux is supported on the M2800 or any particular place I could find any information about this? Mr. Google has not been really helpful with this. Sorry, I don’t know anything about that specific model..
in between apt-add-repository and apt-get install, you need to run an apt-get update. Ciao Lorenzo i would like to buy this pc and wipe out the windows OS in order to install a fresh copy of ubuntu 14.04 or xubuntu 14.04. As far i see the m3800 is sold with a qhd+ monitor and a max resolution of 3200×1800. I don’t know how, at current time, linux (these distributions, to be more precise) could manage this kind of high resolution. I’m worried about the small size of text at native resolution, and i wondered if is possibile to scale down this high resolution in order to achieve an usable desktop with text and icons readable. I often use Eclipse and other software of this kind, run several virtual machines, write docs for projects, electronic sheets, and i carry it with me at university. I read from your blog that with Kubuntu, without get hands dirty, is possibile to change the native resolution to 1920×1080 directly from System Settings->Display Configuration. I would like to ask you if Eclipse or other programs that are not designed for running at very high resolution can run smoothly and without issues at 1920×1080. So, the question is: does the 1920×1080 resolution work nicely on the qhd+ screen? Scale down from 3200×1800 to 1920×1080 is good as to have directly a FullHD screen on this kind of monitor? What’s your experience about working at 1920×1080 with these programs i mentioned? first of all i want to thank you for answering me so quickly. My intention is to change the screen resolution from the native to 1920×1080 in order to use the full HD and get best results, so reduce DPI is out of matter. At cost to be repetitive, i would like to ask you for confirmation of good usability in full HD mode. Surfing on the net, from what i’ve seen there is someone who found some issues in resizing the resolution from to 3200 to 1920: they said that it’s not possible to achieve that, but i suppose they were not using correct driver or found other problems during this process. So, if i wipe out all, and install new fresh version of Ubuntu 14.04, go to monitor settings and change to 1920×1080 should i not encounter any kind of issues about super small text size, icons and etc ? Should it run all perfectly smooth at 1920 (eclipse including) ? Without abusing of your kindness, may i ask you if you’ve tried to use the usb-ethernet device directly bought from Dell ? (i don’t know if is it included in the package because i was not be able to find it as an accessory). Thank you very much and if you want you can answer directly in Italian. Besides that, I confirm that I work with the resolution I blogged about, 1920×1080, and it works perfectly with Eclipse. yes, i meant what have you said. I wanted to have confirmation, just for one more time, on 1) possibility to change resolution to 1920×1080 and using the screen of the laptop in this way without any kind of issue and 2) how would be the result if i had connected an external full HD monitor. So for the question 1) you had already answered me. However, i was thinking the best resolution could be 1600×900 because of 3200/1920 is approx 1.67 and by consequence it should manifest in a general blurring of image (i don’t have any experience with some kind of high density display so i could be completely wrong). For the question 2) i was reading that most depend on the current driver installed on the system, but at this time i cannot be more accurate due to fact i don’t remember where i read it. Do you use bumblebee to switch between integrated GPU to discrete GPU? Or do you use proprietary nvidia drivers ? Concerning bumblebee, I have bumblebee but trying to switch to the more powerful GPU did not work if I remember correctly. That was not important for me because I installed bumblebee just to save power on Linux. I haven’t tried switching to the more powerful graphical adapter since then, and I did not bother fixing that (since at least, I saved power). i can agree with you about the low resolution of 1600×900 but this should be the last shore if the 1920×1080 is (slightly or significantly?) blurred. So i guess it’s time to summarize; if you could give me an advice, what kind of screen would you recommend me? The fhd or qhd ? (Obviously it’s based upon your experience). In addition (but it’s just a curiosity) i was wondering if the choosing of fhd instead of qhd+ could impact positively on battery life duration. However, to answer this question i think it’s necessary that someone who bought the same model with fhd screen decides to share his experience. Thanks for your patience, I’m sure this information will be useful to many other users like me who are looking for someone who has actually tried and used this high end pc. what do you mean by “fhd or qhd”? Did you ever get two external screens working? I’ve just tried it with Kubuntu 14.10. I found it almost works. When I plug two screens in, the desktop automatically extended to both of them, I could drag windows to them and everything works great. Unfortunately the default layout selected for the screens in the desktop isn’t what I want (it lays them all out side-by-side, I want the laptop screen at the bottom and the two external screens side-by-side at the top). 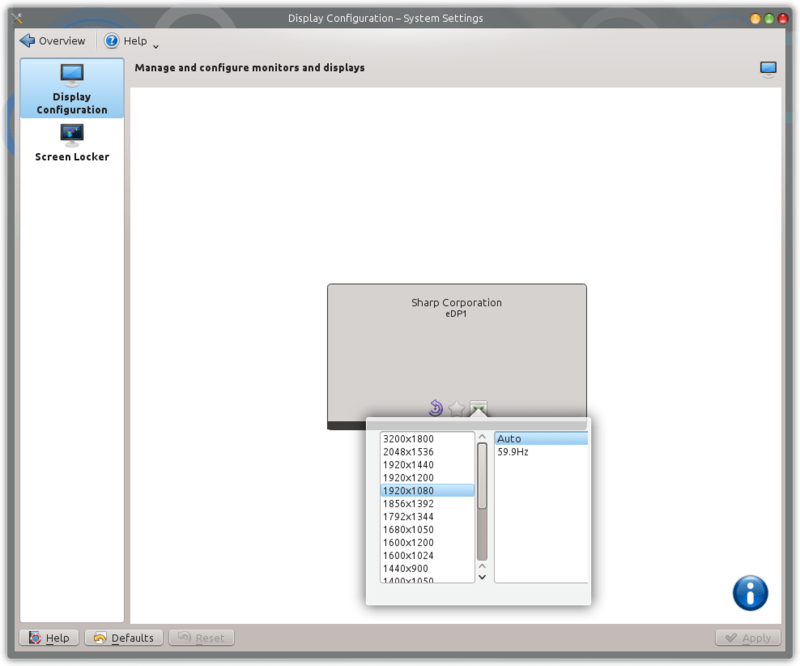 I tried changing the layout in the KDE display configuration tool but once I do this and click OK or Apply, the display on the miniDP port disappears from the layout in the configuration tool and won’t come back until I disconnect and reconnect the screen via the port (and then it goes back to the default layout). If I do this several times KDE or something ends up crashing and I have to end the KDE session via the power button (I can move the cursor around on the screen(s) but nothing else). It has a mini-display port and an HDMI port; I don’t know about Thunderbolt, but I don’t think so (you may want to check specs though).